Sam Cooper and his friends Tony and Tom find themselves in a terrible predicament. Riding their bikes down the steepest hill in Harper’s Inlet Sam Cooper realizes he has no breaks. He is riding a bike his father picked up out of the trash for him. Sam is sure that this can’t turn out good in any way. His friends keep telling him to land in the grass and it will be okay. At the bottom of the hill Sam hits the fence and is thrown backward over his friend’s head. This turned out to be extremely good in many ways. 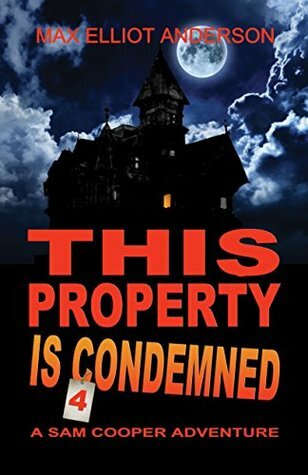 As Sam picks himself up he sees a sign that reads, ‘This property condemned”. As always, Sam has to find out more. He learns the old mansion belongs to an elderly lady who lives in the place called Remington Mansion. Her husband had built the house. Now someone is trying to take it away. Can Sam and his friends save the day again? This was a very intense read for me. Every time there was some sort of danger I found myself sitting on the edge of my couch, rocking back and forth. The author does a wonderful job of creating realistic characters, and enough tension to keep you turning page after page. I can’t speak highly enough about the Sam Cooper Series. I have loved each and every one of the books in the series. Highly recommended, especially for that reluctant reader in your life.